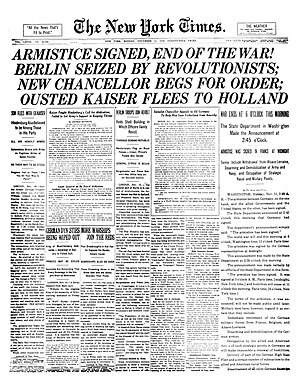 This article is about the revolutions in 1918–19. For the revolutions in 1848, see German revolutions of 1848–49. For the revolution in East Germany, see Die Wende. For other uses, see German revolution (disambiguation). 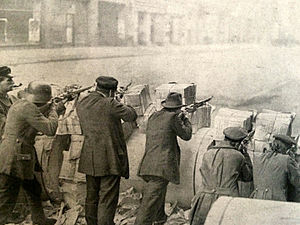 The German Revolution or November Revolution (German: Novemberrevolution) was a civil conflict in the German Empire at the end of the First World War that resulted in the replacement of the German federal constitutional monarchy with a democratic parliamentary republic that later became known as the Weimar Republic. The revolutionary period lasted from November 1918 until the adoption in August 1919 of the Weimar Constitution. The roots of the revolution lay in the German Empire's defeat in the First World War and the social tensions that came to a head shortly thereafter. The first acts of revolution were triggered by the policies of the German Supreme Command of the Army and its lack of coordination with the Naval Command. In the face of defeat, the Naval Command insisted on trying to precipitate a climactic battle with the British Royal Navy by means of its naval order of 24 October 1918. The battle never took place. Instead of obeying their orders to begin preparations to fight the British, German sailors led a revolt in the naval ports of Wilhelmshaven on 29 October 1918, followed by the Kiel mutiny in the first days of November. 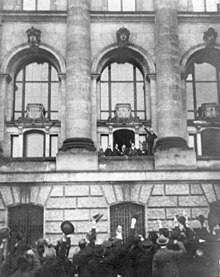 These disturbances spread the spirit of civil unrest across Germany and ultimately led to the proclamation of a republic on 9 November 1918. Shortly thereafter, Emperor Wilhelm II abdicated his throne and fled the country. At the congresses of the Second Socialist International, the SPD had always agreed to resolutions asking for combined action of Socialists in case of a war. 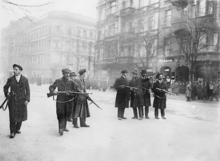 Following the assassination of Archduke Franz Ferdinand in Sarajevo, the SPD, like other socialist parties in Europe, organised anti-war demonstrations during the July Crisis. After Rosa Luxemburg called for disobedience and rejection of war in the name of the entire party as a representative of the left wing of the party, the Imperial government planned to arrest the party leaders immediately at the onset of war. Friedrich Ebert, one of the two party leaders since 1913, travelled to Zürich with Otto Braun to save the party's funds from being confiscated. As the war dragged on and the death tolls rose, more SPD members began to question the adherence to the Burgfrieden (the truce in domestic politics) of 1914. The SPD also objected to the domestic misery that followed the dismissal of Erich von Falkenhayn as Chief of the General Staff in 1916. His replacement, Paul von Hindenburg, introduced the Hindenburg Programme by which the guidelines of German policy were de facto set by the Supreme Army Command (German: Oberste Heeresleitung), not the emperor and the chancellor. Hindenburg's subordinate, Erich Ludendorff, took on broad responsibilities for directing wartime policies that were extensive. Although the Emperor and Hindenburg were his nominal superiors, it was Ludendorff who made the important decisions. Hindenburg and Ludendorff persisted with ruthless strategies aimed at achieving military victory, pursued expansionist and aggressive war goals and subjugated civilian life to the needs of the war and the war economy. For the labour force, that often meant 12-hour work days at minimal wages with inadequate food. The Hilfsdienstgesetz (Auxiliary Service Law) forced all men not in the armed forces to work. After the SPD leadership, under Friedrich Ebert, excluded the opponents of the war from his party, the Spartacists joined with so-called "Revisionists" such as Eduard Bernstein and Centrists such as Karl Kautsky to found the fully anti-war Independent Social Democratic Party of Germany (USPD) under the leadership of Hugo Haase on 9 April 1917. The SPD was now known as the Majority Social Democratic Party of Germany (MSPD) and continued to be led by Friedrich Ebert. The USPD demanded an immediate end to the war and a further democratisation of Germany but did not have a unified agenda for social policies. The Spartacist League, which until then had opposed a split of the party, now made up the left wing of the USPD. Both the USPD and the Spartacists continued their anti-war propaganda in factories, especially in the armament plants. Thus, the so-called "stab-in-the-back legend" (German: Dolchstoßlegende) was born, according to which the revolutionaries had attacked the undefeated army from the rear and turned an almost-certain victory into a defeat. Kiel mutiny: the soldiers' council of Prinzregent Luitpold. The sailors' revolt started in the Schillig Roads off Wilhelmshaven, where the German fleet had anchored in expectation of battle. During the night of 29–30 October 1918, some crews refused to obey orders. Sailors on board three ships of the Third Navy Squadron refused to weigh anchor. Part of the crew of SMS Thüringen and SMS Helgoland, two battleships of the I Battle Squadron, committed outright mutiny and sabotage. However, when some torpedo boats directed their guns onto these ships a day later, the mutineers gave up and were led away without any resistance. Nonetheless, the Naval Command had to drop its plans for a naval engagement with British naval forces since it was felt that the loyalty of the crews could not be relied upon any more. The III Battle Squadron was ordered back to Kiel. The squadron commander Vice-Admiral Kraft carried out a maneuver with his battleships in Heligoland Bight. The maneuver was successful, and he believed that he had regained control of his crews. While moving through the Kiel Canal, he had 47 of the crew of SMS Markgraf, who were seen as the ringleaders, imprisoned. In Holtenau (the end of the canal in Kiel), they were taken to the Arrestanstalt (military prison) in Kiel and to Fort Herwarth in the north of Kiel. Around 4 November, delegations of the sailors dispersed to all of the major cities in Germany. By 7 November, the revolution had seized all large coastal cities as well as Hanover, Brunswick, Frankfurt on Main, and Munich. In Munich, a "Workers' and Soldiers' Council" forced the last King of Bavaria, Ludwig III, to abdicate. Bavaria was the first member state of the German Empire to be declared a Volksstaat, the People's State of Bavaria, by Kurt Eisner of the USPD. In the following days, the dynastic rulers of all the other German states abdicated; the last was Günther Victor, Prince of Schwarzburg, on 23 November. The Workers' and Soldiers' Councils were almost entirely made up of MSPD and USPD members. Their program was democracy, pacifism and anti-militarism. Apart from the dynastic families, they deprived only the military commands of their power and privilege. The duties of the imperial civilian administration and office bearers such as police, municipal administrations and courts were not curtailed or interfered with. There were hardly any confiscations of property or occupation of factories, because such measures were expected from the new government. In order to create an executive committed to the revolution and to the future of the new government, the councils for the moment claimed only to take over the supervision of the administration from the military commands. Thus, the MSPD was able to establish a firm base on the local level. But while the councils believed they were acting in the interest of the new order, the party leaders of the MSPD regarded them as disturbing elements for a peaceful changeover of power[clarification needed] that they imagined already to have taken place. Along with the middle-class parties, they demanded speedy elections for a national assembly that would make the final decision on the constitution of the new state. This soon brought the MSPD into opposition with many of the revolutionaries. It was especially the USPD that took over[clarification needed] their demands, one of which was to delay elections as long as possible to try to achieve a fait accompli that met the expectations of a large part of the workforce. By the time the revolution was over in 1918, all 21 German monarchs had been dethroned. In Leipzig, Hamburg, Bremen, Chemnitz, and Gotha, the Workers' and Soldiers' Councils took the city administrations under their control. In addition, in Brunswick, Düsseldorf, Mülheim/Ruhr, and Zwickau, all civil servants loyal to the emperor were arrested. In Hamburg and Bremen, "Red Guards" were formed that were to protect the revolution. The councils deposed the management of the Leuna works, a giant chemical factory near Merseburg. The new councils were often appointed spontaneously and arbitrarily and had no management experience whatsoever. But a majority of councils came to arrangements with the old administrations and saw to it that law and order were quickly restored. For example, Max Weber was part of the workers' council of Heidelberg, and was pleasantly surprised that most members were moderate German liberals. The councils took over the distribution of food, the police force, and the accommodation and provisions of the front-line soldiers that were gradually returning home. The decisive defeat of the left occurred in the first days of the new year in 1919. As in the previous November,[weasel words][according to whom? ], a second revolutionary wave developed, but in this case, it was violently suppressed. The wave was started on 4 January, when the government dismissed the chief constable of Berlin, Emil Eichhorn. The latter was a member of the USPD who had refused to act against the demonstrating workers in the Christmas Crisis. This action resulted in the USPD, Revolutionary Stewards and the KPD chairmen Karl Liebknecht and Wilhelm Pieck to call for a demonstration to take place on the following day. To the surprise[according to whom?] of the initiators, the demonstration turned into an assembly of huge masses. On Sunday, 5 January, as on 9 November 1918, hundreds of thousands of people poured into the centre of Berlin, many of them armed. In the afternoon, the train stations and the newspaper district with the offices of the middle-class press and Vorwärts were occupied. Some of the middle-class papers in the previous days had called not only for the raising of more Freikorps, but also for the murder of the Spartacists. These revolts were triggered by Noske's decision at the end of February to take armed action against the Bremen Soviet Republic. In spite of an offer to negotiate, he ordered his Freikorps units to invade the city. Approximately 400 people were killed in the ensuing fights. ^ a b c d e Volkogonov, Dmitri (1994), Lenin: A New Biography, ISBN 978-0-02-933435-5. ^ "1918 German sailors begin to mutiny". history.com. Retrieved 17 July 2018. Broue, Pierre (2006). The German Revolution 1917–1923. translated by John Archer. Chicago: Haymarket Books. ISBN 1-931859-32-9. Chris Harman The Lost Revolution: Germany 1918–1923. Bookmarks. 1982. ISBN 0-906224-08-X. Gerhard Hirschfeld, Gerd Krumeich and Irina Renz, 1918. Die Deutschen zwischen Weltkrieg und Revolution. Chr. Links Verlag, Berlin 2018, ISBN 978-3-86153-990-2. Tunstall, Graydon A.: The Military Collapse of the Central Powers, in: 1914-1918-online. International Encyclopedia of the First World War. Weinhauer, Klaus: Labour Movements and Strikes, Social Conflict and Control, Protest and Repression (Germany), in: 1914-1918-online. International Encyclopedia of the First World War. Jones, Mark: Kiel Mutiny, in: 1914-1918-online. International Encyclopedia of the First World War.